The clear coat was a great buy.I thinks it makes the models look that much better. Duplicating the vivid colors in automotive history on model cars is now possible with this specially formulated automotive lacquer authentically matched to factory specs. Provides an extremely durable finish that can be sanded and buffed for a smooth, flawless finish. **Mist on the base coat color of choice. Then evenly coat with the same or different paint color. Once you've acheived the desired affect, clear coat may be applied. The more coats of clear coat the deeper the color becomes! 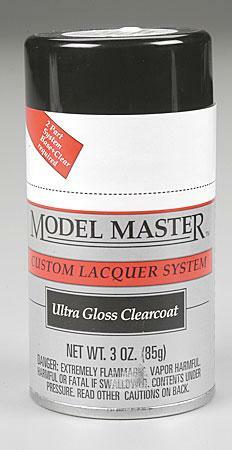 This is the best ultra clear coat spray I&apos;ve ever used. "The final touch for a perfect paint job!" The Ultra Clear coat is amazing. It provides a great surface to apply decals. A day after the decals are applied, I give the model a careful final coat of Ultra Clear coat. It is important that you mist the final coat on to cover the decals and provide a mirror like finish with out spraying too much product on the model. All the painting, except the final clear coat can be done in two hours! I sprayed this over MM Bronze Metallic and didn&apos;t even have to sand or polish. Looks a mile deep with 3 coats, and no bumps!